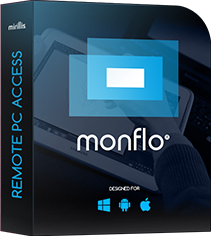 Monflo provides the ultimate performance for Windows desktop remote control and playing PC games on Android devices. It requires to download and install application for your PC and for your Android mobile device. Please read the following information to learn what is required for your PC and Android mobile devices to start playing with Monflo. Download Monflo Server for Windows. Creating Monflo Account is free and allows to easily and quickly connect Android mobile device to PC. It also allows to create lists of favorite PC games and applications and to store your PC game control layouts online. You can create your free Monflo Account using Monflo website or in-app link. Monflo Server and Client app require network connection. It may be any mobile network connection or WiFi. 5GHz WiFi or LTE is recommended for the best experience. Monflo Client app requires minimum Android 4.1 version.